I hope you are having a great Bank Holiday Monday! I know what you are probably thinking, I'm posting my weekly round up on a Monday! 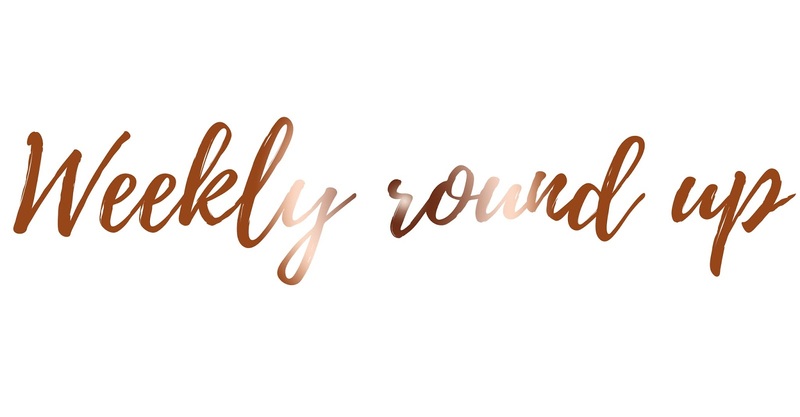 But Yesterday was just a little break and I thought I'd share my weekly round up with you today instead, seeing as we're technically still carrying on with the weekend into Bank Holiday Monday! So last week was my final week at work before having a week off for half term. I say final week, I only work two days a week; but I did break up on Friday! So this half term was my first half term of being in a completely different job role. Although it weren't completely different as I still work as a learning support assistant but instead of working with a young boy with ADHD, I work with a boy in the same class but he has Autism. I have to say, changing job roles can make such a difference to your mental health and I mean a ridiculously large difference. I was so unhappy previously and I absolutely hated going into work and dreaded every single Thursday and Friday of every single week. I was miserable and I knew I had to make a change. Whereas this half term I have been so much happier and I'm no longer dreading going into work. If you know you are unhappy in the job you're currently, the best thing is to leave! You'll always find another job. I am currently preparing going away on holiday. The fun job is going through all of the clothes I wore last summer and seeing if they still fit and I'm so pleased to say everything still fits me! Horraayy! There's me feeling absolutely miserable thinking I put on a heck load of weight when I actually haven't. This week I am also preparing for the Blogger's Beauty Brawl. You'll see an introductory post on the 2nd June where I'll be explaining what the Beauty Brawl is, what you'll expect from it and who else is getting involved so I'm currently trying out products, rating them and deciding whether they're a product I will re-use. I hope you guys are excited to see what this year's Beauty Brawl brings. So that's it from me, I've been pretty bored this weekend and I haven't really done anything but that's the joys of having a Bank Holiday. Fed Up With Feeling Tired?